Dry shampoo can be a lifesaver during hectic times. Whether you are rushing to work or leaving for a spontaneous meetup, washing, blow-drying and styling your hair can be time-consuming. The best organic dry shampoo allows for a quick and easy cover up for any oily or flattened hair. Most products not only offer the benefit of reducing the oils in your hair but also adding some life and fluff back into it as well. We have listed seven specific products that we found to be at the top of the line when it comes to the best organic dry shampoos. The list is ordered according to quality, ingredients, versatility, and overall rating. If you have a busy schedule, you will love this chemical-free, organic dry shampoo. Non-toxic, non-aerosol, vegan and cruelty-free, the shampoo has an adorable, light lavender scent derived from organic lavender buds. It is made with organic ingredients such as powdered petals, natural botanical clays, aluminum-free baking soda. In just minutes, you can get a look of freshly washed, styled and manageable hair! Apply a small amount of powder to your palm, rub hands together, and smooth powder over hair. This all natural, cruelty-free, vegan and eco-friendly dry shampoo by Hair Dance is perfect for busy mornings when you want to refresh your hair and add volume in no time. Made with organic ingredients such as oatmeal, Oryza sativa rice starch, silica, Lavandula oil, and olive leaf, the product is a good alternative to aerosol dry shampoo. The powder efficiently absorbs oil and works well for all hair colors (brunette, blonde, redhead). It instantly adds volume and changes appearance from dirty to fresh and clean. The product does not contain talc, baking sodas, parabens or phtalates. 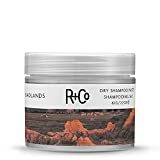 It might be the best organic dry shampoo for camping, workouts, traveling and busy days. Divide hair into sections, and apply a small amount to roots. Lightly massage and brush to remove excess product. The Acure shampoo has a rather long list of benefits, including being gluten, paraben, cruelty, silicone, sulfate, and synthetic fragrance-free. The product is 100% biodegradable as well. The Acure dry shampoo is color safe and includes certified organic ingredients such as corn starch, arrowroot powder, rosemary oil, and peppermint oil. The product comes in a smaller size of 1.7 oz., but the small amount tends to last a while. It is worth mentioning that this particular shampoo is not suitable for darker hair colors as it is a white powder and would most likely leave a white coating or tint to the hair. Shake a small amount of the powder into your hands and caress evenly over the scalp. Once applied, brush out to remove excess powder buildup. Lulu Dry Shampoo is a handmade powder that utilizes paraben and talc free, all natural ingredients. This particular item includes a long list of ingredients. The ingredients include corn starch, white clay, baking soda, rice powder, horsetail powder, and lavender/clary sage essential oils. 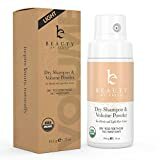 An added benefit that makes this product stand out from the rest on the list of best organic dry shampoo is that this brand is available in other scents, such as jasmine and patchouli and amber. This powder can also be used by both men and women. It is also a solid option for the best organic dry shampoo for dark hair and volume. Dispense a dime size portion of the product into your hands and work thoroughly through the roots. The Beauty by Earth Dry Shampoo is Leaping Bunny certified (cruelty-free) and USDA organic certified. It includes ingredients such as kaolin clay, cornstarch, arrowroot powder, clay, baking soda, turmeric root powder, and lavender oil. This powder was specifically made for lighter shades of hair like blondes and strawberry blondes and can easily be used by both men and women because of its subtle scent. The formula won’t irritate your scalp, and will add nice volume to your hair. First, shake the bottle before application. Section hair into small portions. While holding the bottle 6in. away from the scalp, spray the product until you can see a fine powder. Once applied, massage gently through hair. The Badlands paste takes an adventurous step in a different direction. It does this by combining dry shampoo and a styling paste substance. This allows users to not only clear up the grease but to also style and thicken the hair for volume and texture. The company uses all paraben, gluten, mineral oil, petrolatum, sulfate, and cruelty-free ingredients. The key ingredients include volcanic ash, coconut oil, zeolite, and sunflower seed extract. 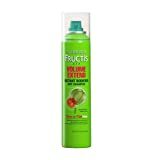 The product is completely color safe and washes out very easily after use. According to reviews, the paste is the best organic dry shampoo for those with thin, flatten hair. This paste is definitely suitable for both women and men and does not carry too strong of a scent. Rub a small amount of the paste into your fingers and apply to second-day hair. For extra volume, apply to wet hair and blow-dry. Coming up at number three on our list for best organic dry shampoo, we have the Mermaid Dry Shampoo. The organic, all natural Mermaid Dry Shampoo incorporates ingredients that are talc, paraben, sulfate, GMO and cruelty-free. The list of ingredients includes organic arrowroot, aluminum free baking soda, kaolin clay, rice powder, and essential oils. These essential oils consist of rose, geranium, and Parma Rosa. This combination gives the powder a beachy scent. This shampoo can be used by everyone. Sprinkle some of the product throughout your hair and work powder through the roots of your hair. The Rapunzel dry shampoo powder comes in place at second on our list of best organic dry shampoo for a few simple reasons. The powder is organic, natural and vegan. It was specifically created to give your hair volume but still works efficiently to blend into the hair and conceal any greasy looking locks. All of the Rapunzel’s ingredients are derived from essential oils and plants. It carries a light scent due to the essential oils and, because it is made with organic ingredients, is safe for most skin types. Sprinkle a little bit of the powder into the palm of hands. Apply powder to scalp and sections of hair as needed. Brush product through to blend. 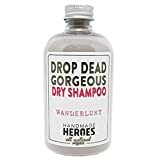 At the top of our list of the best organic dry shampoo, we have the Drop Dead Gorgeous Dry Shampoo Powder. This shampoo is an all natural, all vegan, and completely cruelty-free powder that comes in a stylish and modern container. 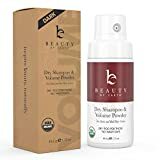 This particular dry shampoo was made specifically for dark hair so that any excess powder blends well with deeper tones. Although, it can be used by lighter shades as well. It does not contain any parabens, preservatives, or synthetic chemicals and incorporates a few essential oils for a fresh, flowery scent. The ingredients include rice powder, kaolin clay, cocoa powder, bamboo charcoal and a mix of peppermint, eucalyptus, lavender, and geranium oils. The Kaolin clay works to keep grease at bay while the cocoa powder is what lends the shampoo its darker tint. The Drop Dead Gorgeous Dry Shampoo can be used by women, men or children. However, the lavender based scent may lean on the more feminine side. The directions call for the user to shake a small amount of the powder onto the scalp, then massage gently into hair for about 5-10 seconds. Overall, the Drop Dead Gorgeous Dry Shampoo came up at first place on our list of best organic dry shampoo because of its all-natural ingredients, well-known quality, versatility in hair color and genders, and moderate size. Although this is the product most recommended among the group, all of these items listed are fairly well-rounded products that could benefit you depending on your preferences. Which is the best organic dry shampoo in your opinion? Share your experience in the comment section below.